Thanksgiving is just around the corner. If you haven’t already arranged for your desserts, please think about ordering one from St. Luke’s. They are homemade and in addition to enhancing your Thanksgiving table, they will provide you with the happy knowledge that your feast is helping provide a meal to someone in need, through the North Brooklyn Angels Mobile Soup Kitchen, which receives 200% of your donation — yes, that’s right, a generous donor has offered to double the St. Luke’s donation to this wonderful food truck, which provides 1,000 meals a week, so if you buy a pie for $20, you’re donating $40 to a very worthy cause. 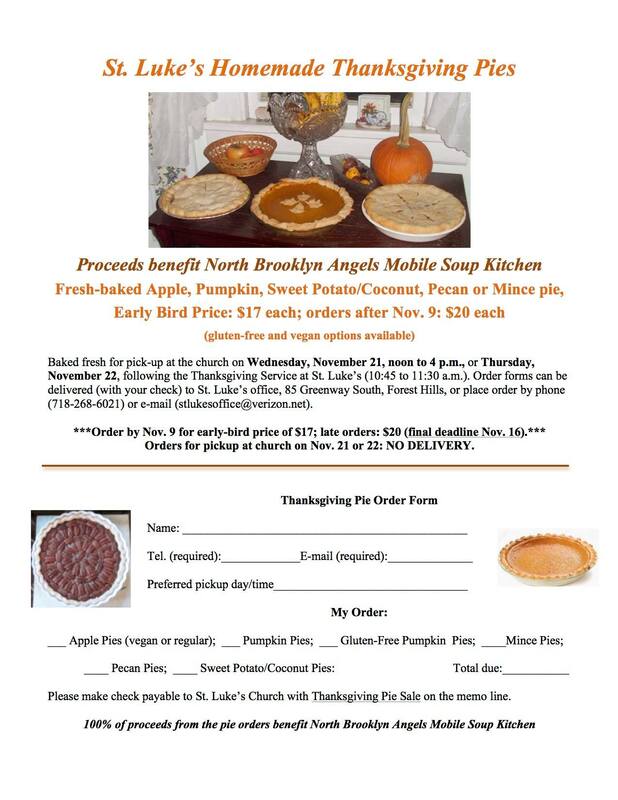 No user commented in " Thanksgiving Homemade Pies to Support North Brooklyn Angels Mobile Soup Kitchen "